Whether you’re a professional tradesperson in need of a retractable knife for working on-site, or looking for a safety knife for DIY jobs at home, browse our range to find the best utility knife for you. At SGS we have a variety of Milwaukee and OX snap on knives and blades to make sure you’re prepared for the task. From fastback utility knives and safety knives, to retractable knives and snap off blades, we have a knife for any job. There are a great selection of knives and blades available here at SGS. Milwaukee have a collection of snap off knives and blades to help you get the job done. 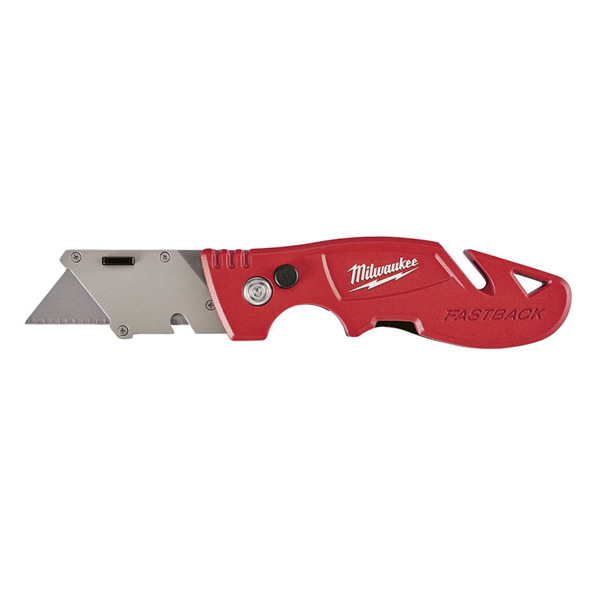 Available is the Milwaukee Fastback Flip Utility Knife with Blade Storage, which was designed for the busy tradesperson. This is a folding utility knife with a magnetic storage compartment that holds up to four blades. For convenience, the Milwaukee Fastback Compact Flip Utility Knife is small but powerful and can be easily stored on a belt or inside a pocket, while the press and flip design provides fast blade changes. Also available is the Milwaukee Self-Retracting Safety Knife, a utility knife with two blade positions, to provide a more accurate cut. The Milwaukee Snap Off Blades are made from iron carbide metal for longer life and have precise ground cutting edges for cleaner cuts. They have an optimized cutting angle geometry for sharpness and improved cutting precision. A range of knives are available on the website from snap knives, fastback compact flip and fastback flip utility knives. The snap knives range from 9mm to 25mm. Snap knife blades can be purchased on the website in a pack off ten from 9mm, 18mm and 25mm. Milwaukee general purpose blades are also available in single and 5 piece packs. Our Milwaukee knife and blade range are essential for professional trade work and home DIY projects. Milwaukee blades are made from iron carbide metal, for clean precision cuts and a longer life. Buy with confidence from SGS Engineering, as our Milwaukee utility knives include a three-year warranty.